We recognize that our children are our greatest resource and the future of this church and this community. As such, we strive to provide them with a strong spiritual foundation that encourages exploration, understanding, and respect for one another and for people of all backgrounds and faith traditions. The children meet at 9:30 on Sunday mornings for Sunday School in the downstairs classroom next to the nursery. Children through the fourth grade attend worship with their family until they are dismissed to participate in Children's Church. Early in the service they are invited to be seated on the front pew to hear The Spoken Word Unfolding for Children. We also encourage their active participation in worship with tasks such as assisting with setting the Communion Table during the service. What a wonderful experience we have had with the children and adults! Living and Loving in Community! 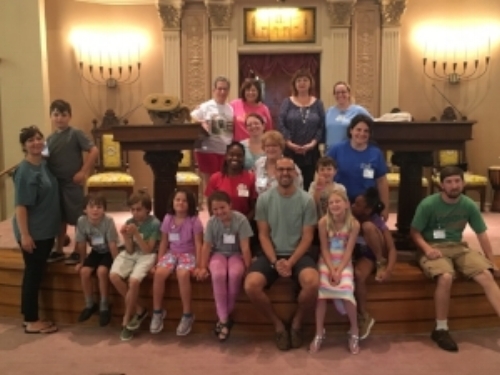 Our time at Temple Beth Israel with Rabbi Arron and at the Islamic Center were such great opportunities to visit and learn about other faiths with which we share stories and understandings of loving God and loving others.